‘There’s nothing admirable about humiliating people who can’t find work, nothing good about building the economy on the backs of the poor, and nothing smart about making it unaffordable to see a doctor’. Out of the 20 or so interviews I watched on ABC News 24 this evening, there was only ONE person who was positive outside of the lot, and that was the representative of a Corporate Australia group. Unsurprising? Now who knows, maybe that’s bias, but lets look at the facts. I have heard a bunch of rhetoric around “everyone must do their bit” to fill this budget deficit, as an answer to the deep cuts. For the moment, lets set aside the stuff that Labour and Greens keep talking about in terms of whether we really do have a problem or not (or whether the problem is as big as Liberals say it is), just because we have a Triple A credit rating, better than the US (blah, blah blah). What I want to know is, when a representative of Corporate Australia smugly says “we’ll cop it, we’ll do out bit for the good of the country” – is it a FAIR ‘bit’? i.e. are corporates/companies copping a proportionately fair amount of either cuts to services or additional taxes? 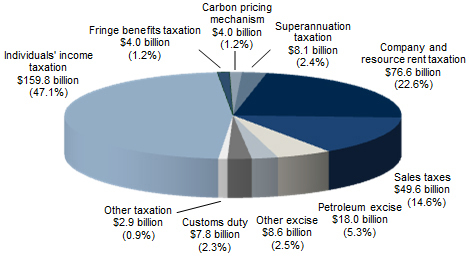 I don’t have exact figures on this, it has got some assumptions and worked backwards from this pie chart which shows a breakdown of tax contributions by segment to the Australian Govt annual revenue. It’s 12am and I should be sleeping before an 8am catch up in the city and not writing a blog but I need to get this out! So based on this, lets assume Corporate Australia (or at least companies) make about $153 billion in revenue post-costs (as company tax rate is 30% and that’s 3 times 76.6 billion) and according to the budget, they’re going to cop a $500m reduction (+ some other minor millions for certain key industries such as the auto industry). That’s a 0.3% contribution based on total company revenue. Australian citizens on the other hand, they’ll pay a total of $138m for an average of 6.9 visits to the doctor annually, plus $400m from the “top earners” paying a short term 2% extra tax on any amount earned above $180k which is already taxed at 45 cents in the dollar – (in the mean time, companies pay 30 cents in the dollar despite earning billions). Lastly add to that the losses, the cuts of $80 billion across Health and Education (forget the investment into Medical Research…$20 billion is nothing in the world of Pharma – if a cool $20 billion was all it took to cure cancer as Joe Hockey tried to sell, trust me, it would have been done). So, we add the taxes and the losses together for the average Aussie citizen and we get a total of $80.5 billion. That’s a 13% “contribution” by Australian citizens who let’s say earn an aggregate of $600 billion in wages minus tax deductibles (again I’m guessing based on working backwards from the total tax bill). Let me repeat and make clear: 13% effective contribution averaged across ALL Aussie citizens verses 0.3% effective earnings contribution from companies. So I think we can safely say, that corporate Australia is happy for a reason…because they have in fact, not come even CLOSE to putting in their fair share for these services cuts and new taxes. In the mean time, companies like Apple are being investigated for massive tax evasion (they paid just $193m tax on $27 BILLION REVENUE – that’s right kids, close to 10 BILLION worth of the 80 billion budget cuts being made could have been covered by the tax bill of the company you bought your last iPhone or iMac from). Then there is the LOST revenue of the carbon tax which was going to be over $4b a year – now resulting, instead, in cuts to health and education when that could have been borne by business. Instead, Aussie’s were worried about it hitting their pockets through high electricity bills. Well guess what, its hitting their pocket anyway…and its even worse than the electricity bill. Now, I’m not a maths whiz by any means…nor am I anti-corporate or company. I have 3 start ups and I run my own business! But I am also a citizen of the world and it seems to be, something is seriously, seriously wrong here. And that’s already $57 billion over a 3 year period. Budget problem solved. Hehe. Obviously I am oversimplifying it, I get that. But, sometimes looking at things simply, can help gain perspective. One of my startups had a business model with a very complex formula, and today the business valuer found an error because he checked the math doing some really simple backward calculations. In my very humble opinion, we live in a highly symbiotic relationship – businesses, and individuals – particularly in the way our capitalist society with socialist elements has been set up here in Australia. That means that any major structural changes…to either side, can be highly damaging. You can’t just take from one segment, you must take in proportional amounts, and those proportionate amounts must take into consideration the fact that equal contributions may not be enough (i.e. company profits go back into the company but profits are not forced to be distributed into new labour hire so i.e. more money for companies doesn’t automatically equal more jobs. 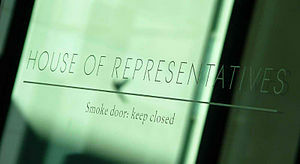 Often they go to shareholders in dividends, and people who can afford to purchase company shares, are not those living on the poverty line – which means companies could AFFORD to bear a greater financial burden, and yet instead they are currently being asked to be just a fraction of it). To shift the cycle, the cuts MUST be done so carefully as to have a proportionate negative effect. Are cuts necessary – may yes, maybe no – that’s actually beside the point. The point is, for the cuts not to wreak havoc by potentially causing other issues (e.g. low education and health standards in research is always correlated to low GDP contribution and low employment rates…etc), the negative effect must be carried fairly by the variety of parties who currently make up the tax revenue for the Australian government. Alright time for bed. I just hope others can find the time and patience to do a bit of sense checking themselves, and come to an informed conclusion, rather than hearing and believing whatever is they hear on TV (regardless of which political party its coming from).